Successfully Added USB Soldering Iron - 5 Volt, 8 Watt, 350 Degries Celcius, Idle Shut Off After 25 Seconds to your Shopping Cart. USB powered soldering iron suitable for surface mount and smaller joint soldering. At 5 Volts and 8 Watts this USB soldering iron is great for small job when you're in the field and ideally suited to use via a power bank. Note that if you use this from a plug in USB charger it could be susceptible to mains leakage that may not be suitable for very sensitive component, however for most jobs its great and offers a portable solution for most soldering needs especially when running from a power bank or even from your laptop or tablets PC USB port. Heating up in just 15 seconds to a surprising 380 degrees Celsius this soldering iron comes into its own when you're working in remote areas, The perfect addition to any toolkit and a must have for engineers this USB soldering iron will save the day when there isn't a power socket around for your trusty Hakko soldering iron. An idle shut off that kicks in after 25 seconds ensures safety and is easily indicated via the LED light. It comes with a mini stand that will keep it out of harm's way when not in immediate use. So if you're looking for a reliable le portable soldering iron for working in the field then this USB powered soldering iron is a great option. 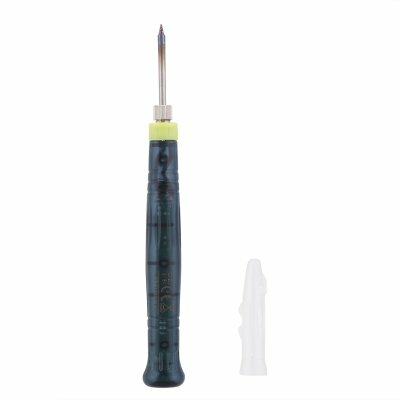 This USB soldering iron comes with 12 months warranty, brought to you by the leader in electronic devices as well as wholesale tools and electronic gadgets..